Is it possible to find a yogurt that tastes great and doesn't inflate your waist? Yes! Does yogurt have to have Sucralose or other artificial sweeteners to be low calorie? No! You can mix your own yogurt with your favorites, put it in a small container and you will have a great tasting snack that is better for you and the environment. But you do have to do a little work. This is a DIY yogurt for taking to work or lunch. 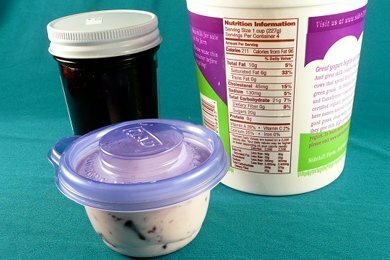 All you have to do is mix your favorite brand of PLAIN yogurt (no-fat, greek, low-fat, all the fat) with your favorite jam (fruit, sugar, no sugar), in a small container. You will save money, calories, and it will taste SO much better than a Yoplait Strawberry Yogurt. AND, you will save the environment, because you won't be tossing out the package at the end. The containers photographed here are from Glad, they are BPA free, and approved for your dish washer (top rack). They retail for about $2.00 for 8 containers. How do I get 60 calories? I have 4 ounces of non-fat yogurt (50) and 1 teaspoon or so of jam (10). This may not be enough sugar for some of you - but you can add more and then get used to having less. Or you can add Stevia or another sweetener. IT IS UP TO YOU. You don't have to worry about added stuff that you didn't want in your yogurt in the first place - for example Yoplait Strawberry Yogurt (there are a bunch of other brands that add yucky stuff too). As for money, a large container of yogurt might cost you $3 for 32 ounces (8 servings) and lets say $3 for the jam. That is $6 for 8 servings and you can usually get Yoplait Strawberry Yogurt (on sale) for 4 for $5. So, it will cost you (without the cost of the containers) $6 versus $10 for your yogurt. A savings of 40%! Of course, this is going to vary based on your part of the country and what you choose to buy - but it is, on average, cheaper to mix your yogurt yourself. Please share your packaged food replacement ideas below? We live on yogurt in our house and these are great ideas. When my daughter was just beginning to eat solid foods, we would mix oatmeal into yogurt, maple syrup and all kinds of jams also. We've never stopped! If you buy frozen fruit it is cheaper and lasts longer. Just pop some pieces into the microwave to thaw them out. Mmm, this is a great idea... I love vanilla yogurt, I bet I could just add a little vanilla extract to my plain yogurt. Can't wait to try this out! I also add frozen fruit to both my plain yogurt and greek yogurt. For a frozen treat, I eat it while the fruit is still frozen without thawing it. Cherries and mangoes are my favorite frozen additions. Sweetening greek yogurt with maple syrup gives it a caramel taste that I don't find if I use honey. One of my toddler son's favorites is vanilla yogurt with cinnamon mixed in. No added sugar but delicious. I've started eating it that way myself! I do the same thing with cottage cheese...just add a little apple butter or strawberry jam. Yum. I make my own yogurt and then swirl in my grandma's homemade raspberry jam. My grandma swears it is easy to make jam but I still haven't tried it. I can attest that the yogurt is easy to make and very cheap. 48 oz of milk makes six servings. All you need is some store bought yogurt to start with for the culture and then save a little bit from your homemade batches for next time. I do use a yogurt machine. I have one that uses lots of little glass jars. The nice thing about that is that my son really enjoys eating out of them versus using a bowl. Also, just basic small jelly jars and other random jars that I have collecting (like the kind that hold chopped garlic) fit in there so I don't have to wait until all six jars have been eaten to make another batch. The bad thing about it is that if I want to strain the yogurt I have made to make lebneh (yogurt cheese) then I have to scrape out all the little jars, more dishes, more work.... bah! But I still like my little yogurt machine. Okay, I went to the store and there was jelly, jam, fruit spread, and preserves. The only specifically named jam had HFCS so I'm confused if that's what I should be using. Should I be looking for certain brands? I like to add unsweetened applesauce to my nf Fage! I recently started adding dried, unsweetened blueberries. I'm gonna start buying a bigger tub of Fage and throw some frozen fruit in there so it wil be great for my afternoon snack! I am totally with you in that I don't want a bunch of extra STUFF added into my yogurt. My toddlers have some every day for lunch and they happily eat it plain or with a little agave drizzled in. P.S. I do add unflavored gelatin sometimes to thicken ours but it works just fine without it. added. My "go to" breakfast is yogurt mixed with Snack Girl's homemade granola with some fruit stirred in. I have just signed up for this newsletter and am absolutely delighted with what's happening here! Never before heard of penbut butter powder as mentioned, so need to check for it further. Age 83, dissbled/handicapped,homeboud except for occasional appointments, butstill striving to look and feel my best. Please mention how important it is to purchase organic dairy products. For those who are looking for the *delicious* version of powdered peanut butter - and is NOT full of chemicals and junk while still maintaining good-for-you nutrition - see below! Calories: 45 <-- yes that IS correct! I love homemade yogurt. It has a milder/sweeter flavour than store bought. Use a pot at least twice the volume of milk to give the boiled milk room to expand. Bring remaining milk quickly to the boil, stirring constantly. Set aside to cool to 118°F (48°C), this can be speeded by half filling sink with cold water and puting pot in it. While the milk is cooling rinse a container with boiling water, then dry. When the milk has cooled to about 115°F (46°C) pour 2 cups(480 ml) milk into steralized container, add yogurt starter and whisk until smooth. Pour in remaining milk and powdered milk mixture and blend well. The milk temperature should now be near 112°F (44°C,) the ideal temperature for starting plain yogurt. Cover with a clean towel or lid and quickly put the container in a warm place, 85°-110°F (29°-43°C. )If the the environment is too warm, the yogurt will sour before it sets; if ti is too cool, it will not set. Inside an oven with a gas pilot light (NOT TURNED ON) or an electric oven pre-heated at 200°F (95°C) for 1 1/2 minutes, then turned off work well.Alternately a picnic cooler with a tight fitting lid and an open jar of hot water. Alernately a heavy terry towel, blanket, or insulated bag resting near a water heater, radiator, or such heat source. Check after 5-6 hours. It should be just thick and firm, as it cools it will set up considerably. The longer you let it set up once it is firm, the stronger and more tart it will be. If it is not set, check every hour, up to 12 hours inclusive. If the yogurt has not set by then, there are several possible causes: Stale or insufficiently steralized milk, inadequate blending of the starter in the milk, inadequate insulation durring setting, or worn-out starter. Refridgerate, covered, once starter is set. Best used in 3 days, though it will last 4-5. After that, it is best used in cooking. Once fully chilled you can strain it through thin cotton or coffee filters for a thicker yogurt cheese. After seeing a nutritionist, I'm working on balancing protien with fiber within a meal. Greek nonfat yogurt, added with fresh blueberries (or some type of berry or mango for fiber) and I add sugar free vanilla syrup that I put in my coffee. Delicious. I love the idea of adding sugarfree jam, but this should not take the place of a serving of fresh fruit. I am looking for a pre-diabetic diet, so am avoiding bananas, nuts and breads. She suggested for a chicken burger, only eat 1/2 the bun, or animal style. No catsup. How exactly are you saving money... you still have to buy the plain yogurt... which is just as much money as the flavored stuff....?